An Old Spice Deodorant that envelopes you in a clean, manly scent that has served mankind for decades,it gives you that just had a shower-in-the-Niagara-falls feeling. This iconic fragrance culminates both vision and tradition with distinctively masculine scents that invigorate and refresh you all day long. 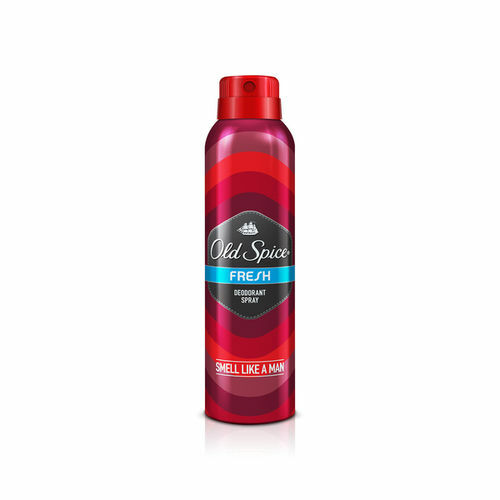 Old Spice Fresh Deodorant Body Spray is classic and modern, vibrant and engaging. Old Spice is mild on your skin and can be used daily. It is an intense, masculine fragrance. A fragrance which is not merely one fragrance but an elegant, one-of-a kind intermingling of essences. Gives you 24 hours odor protection. Additional Information: Old Spice brings you a broad line of products for men who live a dynamic and unconventional life. Old Spice over the years brings authenticity, performance and confidence to male grooming with their legendary men's care products and offers a wide product range for especially for today's man, including anti-perspirants, deodorants, body washes, body sprays, after shaves and colognes. Explore the entire range of Deodorants/Roll-ons available on Nykaa. Shop more Old Spice products here.You can browse through the complete world of Old Spice Deodorants/Roll-ons .